On a rainy Saturday evening (February 10th) in Lorman, Mississippi the in state rival Mississippi Valley State University Delta Devils (MVSU) entered the Davey L. Whitney Complex in hopes of defeating the mighty Braves of Alcorn State University. 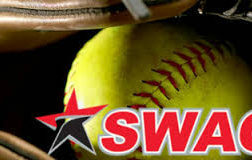 Both teams were seeking to add an additional win to their Southwestern Athletic Conference (SWAC) records. Entering the matchup Alcorn State held a record of (6-17, 2-8) while the Devils sat at the bottom of the Conference with a record of (2-22, 2-8). The 2nd game of the day tipped off as Alcorn State won the tip off and the game began with back to back misses for the Braves. MVSU scored the game’s first bucket on a 3 pointer two minutes into the game. The Delta Devils then forced another Alcorn miss and made yet another three pointer. The extremely athletic Yalen Reed scored Alcorn State’s first bucket on a post hook shot for two points. After a Mississippi Valley State missed shot, Reed wasted no time scoring a lay up for his second field goal of the game. The Braves then took the lead off of a three pointer from Sophomore Maurice Howard and lead 7-6 with 15:30 remaining in the 1st half. After a pair of turnovers, the Delta Devils struck the Braves from the perimeter again to extend their lead to 11-7. 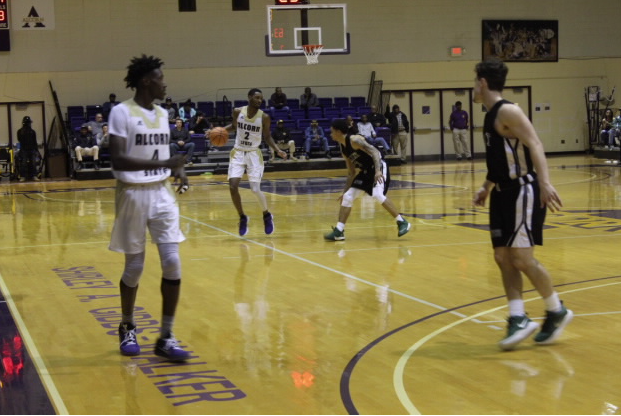 Alcorn’s offense didn’t look as synchronized as it had looked in previous games but Reed was a bright spot for Alcorn as he rebounded a missed shot and scored another bucket while being fouled and eventually converting the ensuing free throw. Going into a media timeout with 11:37 remaining in the 1st half Alcorn State trailed 13-11. Defensively, the Braves established a 3-2 zone defense that led to a steal and Point Guard Avery Patterson’s first basket of the game. While playing this zone, the Braves were able to take their first lead of the game and continue to confuse the Delta Devils on the offensive side of the basketball. Alcorn State’s zone was working effectively and that good defense lead to easy offense. Junior Dante Sterling stole the ball and finished off an acrobatic lay in to jumpstart his great offensive night. Freshman Troymain Crosby got in on the action as he stole a pass and smoothly dropped in a lay up. 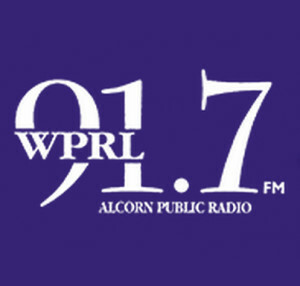 At the seven minute mark of the 1st half Alcorn led 26-17. MVSU continued to pressure the Braves to play well. A pair of turnovers committed by Alcorn State and easy dunks for the Delta Devils resulted in the Braves lead being cut to just six points. The pace of the game started to pick up and so did the consistent scoring. Following turnovers, and several missed shots, the Braves ended up losing their lead. The Delta Devils went on a 20-11 run in which they outscored and out rebounded the Braves. The game entered halftime locked at a 37 all tie. The second half started with a dunk for the Delta Devils that allowed them to retake the lead. On the ensuing Braves’ possession however Sterling drained a deep 3. Mississippi Valley State played inspired basketball early on this half. Their defense was crisp and as a result Alcorn State went into a brief two minute scoring drought until A.J. Mosby found big man Devon Brewer cutting to the rim for a lay in. 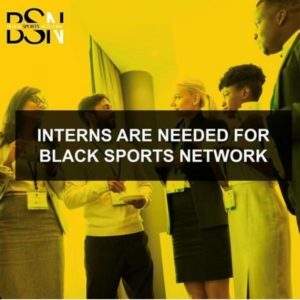 MVSU, however, at the 16:45 mark of the second half, seemed to be peaking offensively as they continued to score from inside the paint and behind the perimeter. Mosby got hot around the 14 minute mark and recorded back to back 3’s much to the crowd’s enjoyment. The score continued to flip flop as Sterling was fouled on a fast break opportunity and made both free throws. 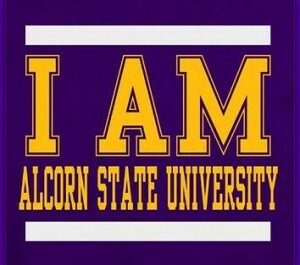 Alcorn State lead 55-54 with just under 13 minutes remaining in regulation. Sterling continued to score the ball at an efficient rate as did Kylan Phillips from MVSU. Phillips scored 8 straight points for the Delta Devils to give them a slim one point lead. With 9:00 remaining, MVSU lead 65-60 behind the excellent play of Phillips. 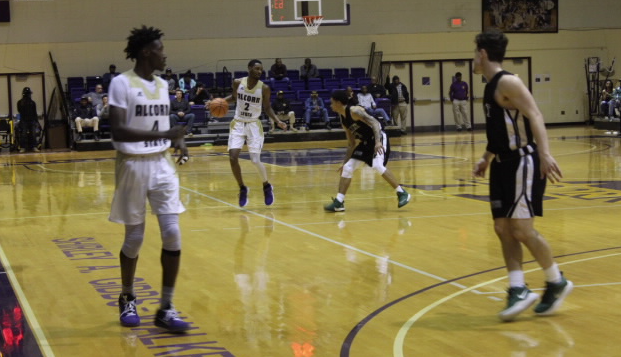 After 2 made free throws by the Delta Devils, Alcorn’s Sterling sank a three pointer to make it a one point game. A few possessions later Reed displayed a thunderous block and Sterling performed a euro step layup to put Alcorn up by one. Following a media timeout, Alcorn was up 68-67 with 7:06 remaining. The Braves were playing well at the four minute mark with Sterling making two free throws and Patterson making a three pointer to make the game 75-71 with 4:45 remaining in regulation. The Delta Devils continued to fight as they brought hard pressure, tying the game up at 75 with 3:30 remaining. Despite MVSU’s defense Howard drained a three point shot which put the Braves back on top for the first time in four minutes at 78-77. The action was intense and played back and forth. With 1:05 left in regulation the Delta Devils lead 82-80 after a clutch basket from Phillips. Mosby then ran down court and scored two points of his own to tie the game with 30 seconds remaining. On the ensuing inbound pass Mosby displayed great hands on defense and caused a turnover while calling a timeout. The Davey L. Whitney Complex went crazy as Alcorn State regained possession of the ball with 7 seconds remaining. The Braves were given an opportunity to win the game at the end of regulation as Sterling got off a good look but missed the buzzer beater. The 2nd half ended in a tie at 82 and overtime was upon us. MVSU won the tipoff in overtime. Overtime started slowly for both sides as they both went scoreless for the first three minutes. Sterling, who had been playing well all night, went to the free throw line and split the foul shots to give Alcorn a 83-82 lead. Overtime saw the Braves get outrebounded by the visiting Delta Devils. No team really ever got going offensively in overtime but foul shots allowed MVSU a 85-83 lead. Moments later Sterling was fouled and knocked down both free throws to tie the game at 85 all. After a Delta Devil’s turnover, Sterling electrified the entire crowd as he dunked on a defender. Eager to recover, Mississippi Valley State committed another turnover as Brewer took a charge for Alcorn. The Braves got the ball with 30 seconds remaining and called a timeout. With 26 seconds remaining Alcorn lead 89-85. Mississippi Valley State came back with a quick bucket to shrink the lead to 89-87. The Braves then iced the game by making their free throws as the Delta Devils had to continue to foul to stop the clock. The final score of the game was 94-90, Braves. 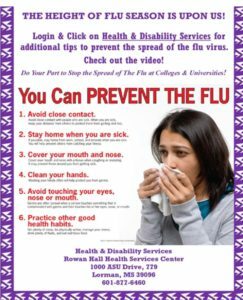 With the win Alcorn improved to (7-17, 3-8) while Mississippi Valley State fell to (2-22, 2-9). Sterling, for the Braves, had a game high 29 points and added 4 assists and 3 steals. Mosby also registered a nice game with 22 points and 7 assists. 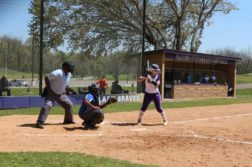 The Braves need only five more victories to ensure they make the SWAC Tournament. There are only 3 home games remaining in the season so be sure to come out and support the Braves’ Men’s Basketball team.